I wrote that tweet nearly a year ago, but the desire to make a move from gmail had been around for a long time before this request. I created a gmail account in 2004 as it was fast, free and offered plenty of space. It has always worked mostly well but I was looking for other options. I finally made a move a few months ago to Fastmail, kind of. This isn’t a technical tutorial for making the switch. 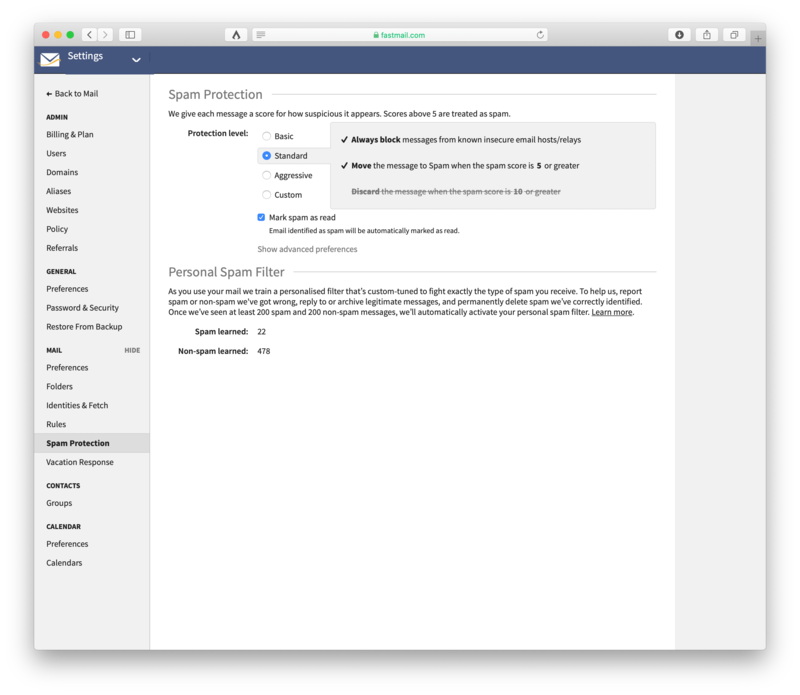 Fastmail has really nice documentation on how to switch your DNS and setting up your clients. This also won’t be an in-depth opinion on privacy, big data and control of our information. People who have strong feelings, already have opinions. And those who don’t know know, usually don’t care. With that laid out, let’s move on. They use some strange technology that isn’t always standard compliant. Connecting to the service with a mail client can be hit or miss and will often break in software updates. I got tired of that. They removed push email for iPhone some time ago. You can’t even pay for it on a @gmail.com address. I’m not one that needs to read email immediately. I don’t have any sound or banner alerts when a message arrives. However, I got tired of opening my email client and then having to wait for the messages to download. They should be there already. I never used any of the gmail labels or the webmail interface. Early in the gmail, the search was super useful but now it’s so effective in a client that the online option isn’t needed. The last six months I’ve tried to simplify nearly all of my tech usage by removing services, subscriptions, and even hardware. I’ll write on this at some point in the future. For the time being, know that this has included moving from services that I feel don’t really need or respect me as a user. There are no ads or scanning of my emails. I just pay them to host my email and they accept that money and provide the service. It’s refreshing. After so many years of “free” email, it was a bit strange to pay for it again. However, after just a few days in the trial, I paid for three years up front. They offer a pretty sizable discount for prepayment and it ended up being about a dime a day. Even I can stomach that. They have an IMAP import tool that will allow login to any account and just slurp your whole history of emails sent and received. I think most people will use this tool and love it. Personally, I like to have a little more control. 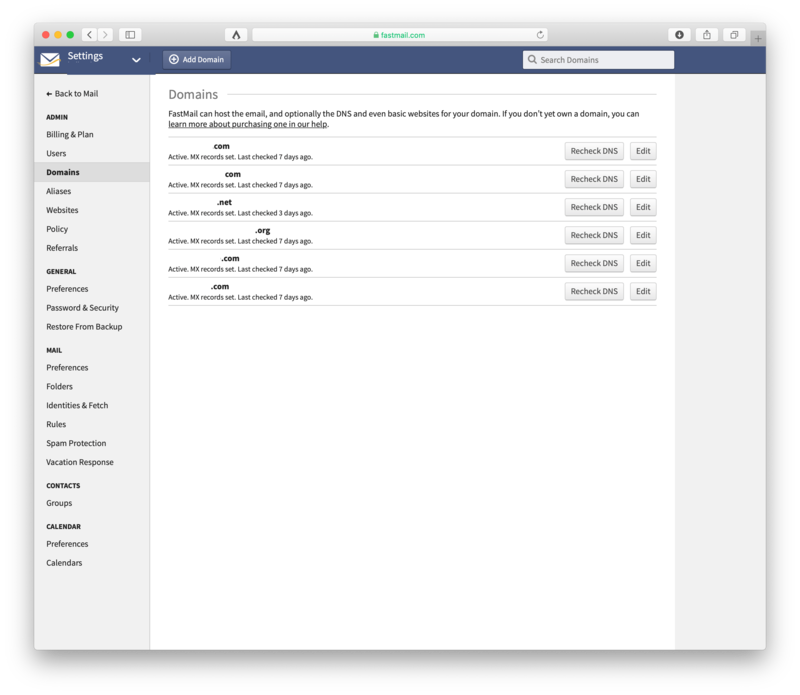 I setup a Mac mini server in a data center and used the Mail.app client to download all emails from all my past accounts. Once they were downloaded (with attachments), I uploaded huge batches to my Fastmail account. 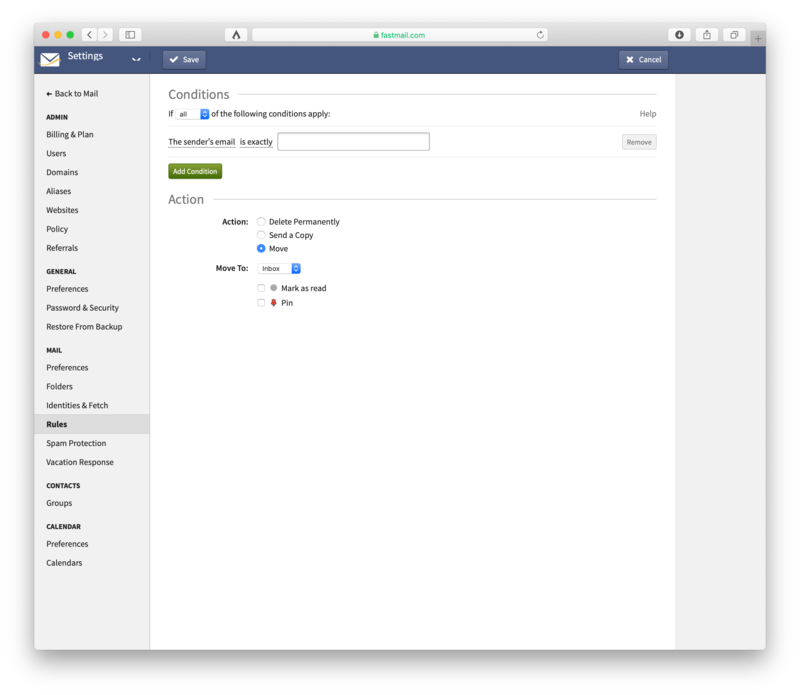 For instance, I’d select 15k emails and drag and drop them to the Fastmail account and let it work overnight. It worked perfectly. This gave me a real good idea of what was moving, and what was not. Fastmail includes incredibly fast push email. This includes push gmail for iPhone and iPad. More on this below as well. Personally, I use Mail.app on Mac and iOS. 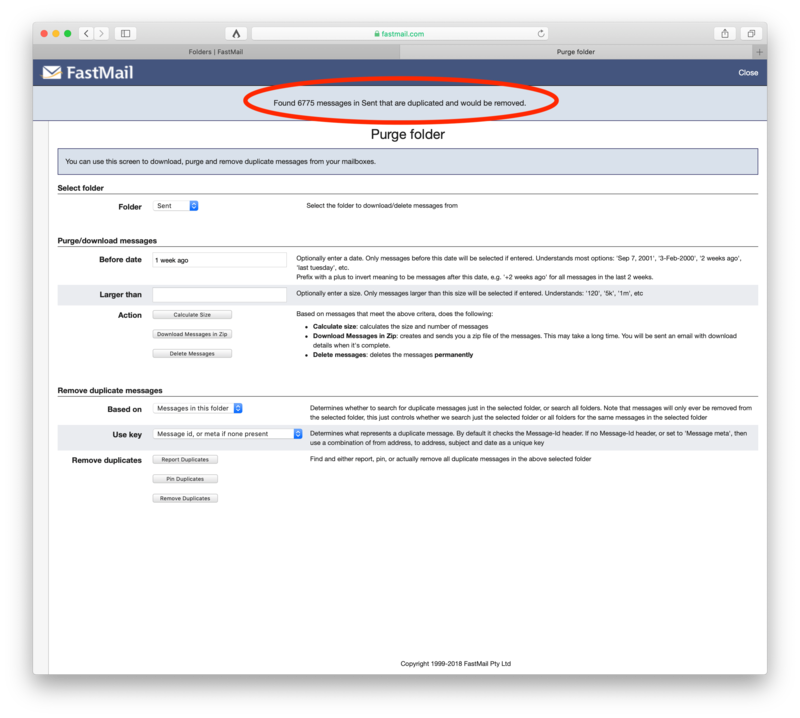 If needed, Fastmail has a really fast webmail interface and also iPhone and iPad apps dedicated to the service. The thing that really sealed the deal for me was how well Fastmail will let me use @Gmail.com without having to use Gmail. Right now, all of my Gmail messages are forwarded to my Fastmail account and then deleted on the gmail service automatically. When I respond, Fastmail will send my response through the Gmail service as well so people still receive from an email address they are used to seeing. If you have questions on the setup, feel free to find me on Twitter. I’ll help if I can. Fastmail also has a one month trial if you want to try it out. All of the links above have been with a referral code that will give you 10% off your first year of service included at checkout. I think I get some sort of credit for bringing you on board, though I’m not sure what. I’ve paid for three more years already so I’ll figure it out when I need to renew. If you make the move, let me know what you think. This is a purge and remove tool. I uploaded 20 years worth of emails from all sorts of places including “On My Mac” folders and other archives. After every few batches, I’d have Fastmail crawl all messages and then report and remove duplicates. In total, there were 25k duplicates removed. You can setup other domains on your account. You just need to setup the DNS to point to Fastmail. Now, user1@domainA.com will also receive emails for user1@domainB.com. 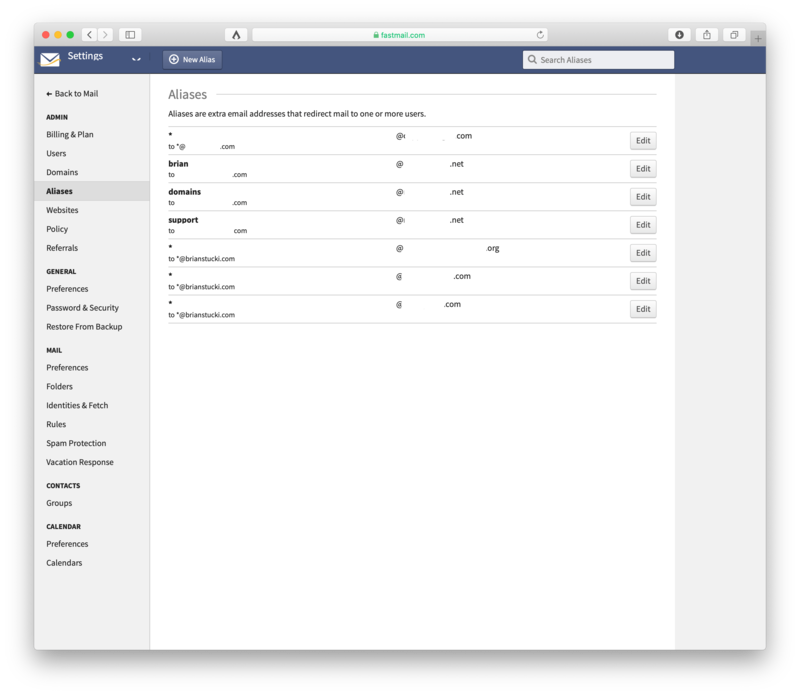 You can also setup aliases on any of the domains. You can set them to be received by just you or even to send to a larger group. In my setup User1@domainA.com and User2@domainA.com will both come to me. This is especially helpful for newsletters and other services. You can setup emails for each of them on the fly so espn@domainA.com and cardealer@DomainA.com will both get to you just the same. It’s similar to adding the “+” in Gmail. 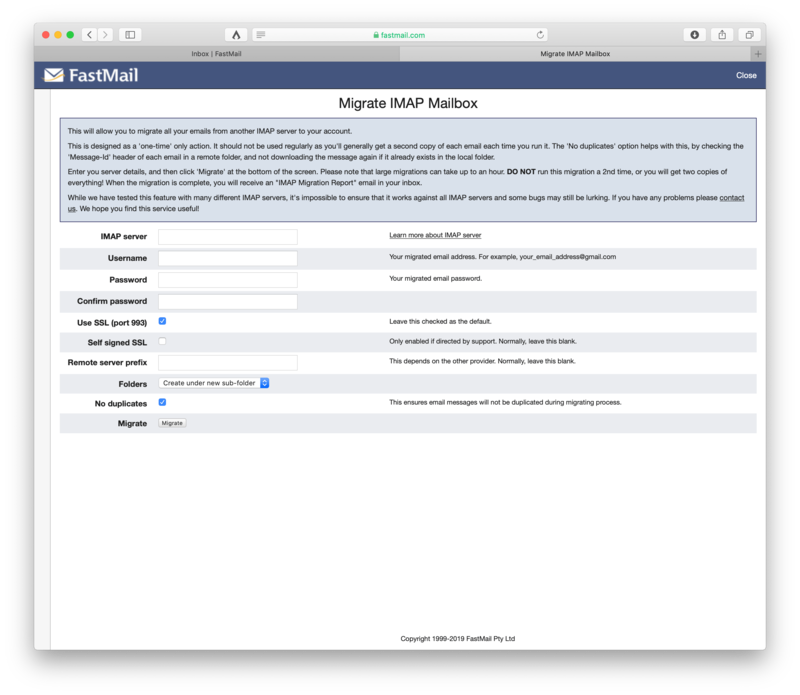 You can also setup Fastmail to send from other domains. This is how I can write through the Fastmail services but have emails sent from @gmail.com. People often ask about spam. I haven’t had any issues. I just leave it at “Standard” and mostly let it do it’s thing. I peruse through and help it learn from time to time. Since I forward all gmail now, I’ve moved all the gmail filters to fast mail. I love the simplicity of adding new rules. This is the import tool. I’m sure it will please most people but I ended up using a mail client and did it manually to have more control. 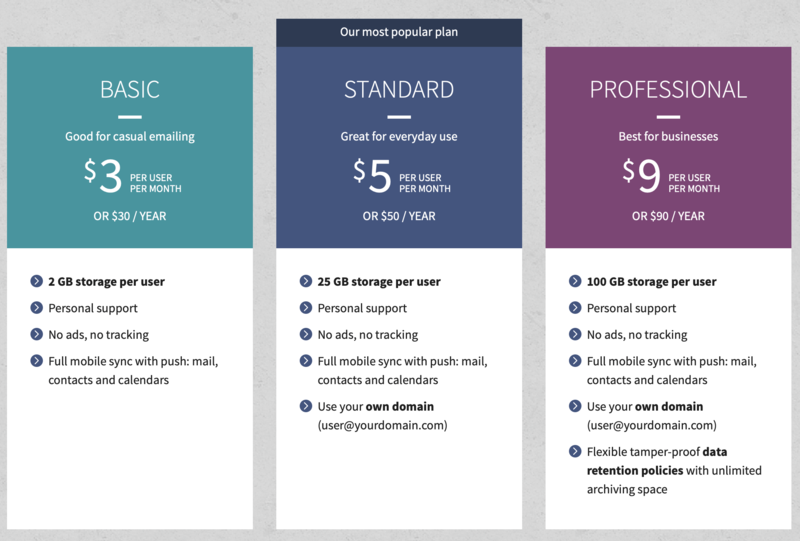 Fastmail pricing. I have the standard option because I think moving to a domain name of your own is one of the most important steps. I prepaid three years and received a good discount.